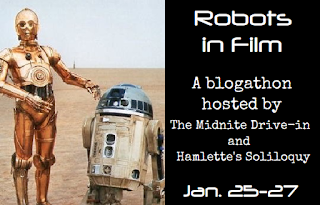 This is my first of 3 entries in the Robots in Film Blogathon being hosted by Hamlette of Hamlette’s Soliloquy and Quiggy of The Midnite Drive-In. Tnx for letting me partake Guys! Brief Synopsis – An inventor creates a brand new kind of watchdog who is really a robot. My Take on it – I can’t really explain why, but when I first heard about this blogathon, this film was actually the very first one to come to mind. 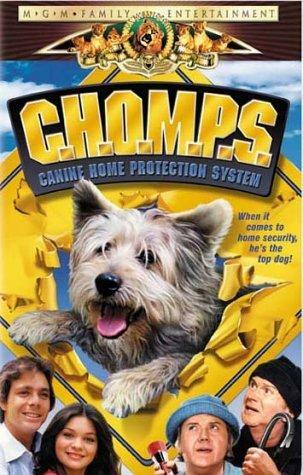 I haven’t seen it in more than 35 years and remembered just the fact that it was about a robotic dog. Other than that I had no recollection of what to expect. The film is fun but it is completely silly the entire way through and actually makes little sense. This is all quite unfortunate because the premise is quite good but the way they present things just doesn’t keep it interesting at all. The cast of this film is ok and it was nice seeing some well known actors in some key roles. Valerie Bertinelli, Conrad Bain, Jim Backus and Red Buttons all appear here, but none of them are given enough to work with. The story snowballs into utter silliness as things just get crazier and crazier along the way. Bottom Line – Fun film that is too silly for its own good. The premise is actually a great one but they just don’t present it well enough for it to seem very realistic. The cast is ok and there are some nice performances by a few well known actors but none of them are given enough to really work with to make this film more enjoyable. The story gets sillier and sillier as it moves along and could have been made so much more interestingly than they do here. Ha! I have not thought about this cheesy movie in years…what a classic 1970s-1980s cast, even Valerie Bertinelli and Wesley are right, not a good film, but a great curiosity! Ohhhhhh boy. Robot dogs just sound kinda scary! Maybe that’s because they make me think of the Mechanical Hound from Fahrenheit 451. Thanks for joining the blogathon!